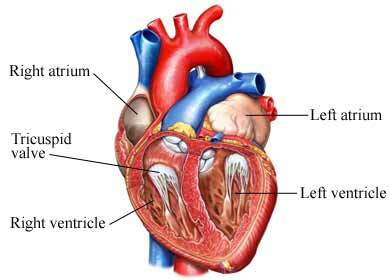 Tricuspid valve disease is damage to a valve in the heart. This valve sits between the upper and lower chambers on the right side of the heart. It helps to control the flow of blood from the body to the lungs. This valve has 3 flaps that control the direction and flow of blood. Having had rheumatic fever may increase the chance of tricuspid valve disease. You will be asked about your symptoms and past health. A physical exam will be done. The doctor may hear a murmur while listening to the heart. The heart's electrical activity may need to be checked. This can be done with EKG. A cardiac stress test may also be done. It will show how the heart works under physical work. Surgery may be needed for severe symptoms. The valve may be repaired or replaced. Tricuspid valve disease itself cannot be prevented. Strep throat can lead to rheumatic fever. Treating the infection early may lower your risk of complications. Antibiotic prophylaxis for heart patients. Mouth Healthy—American Dental Association website. Available at: http://www.mouthhealthy.org/en/az-topics/a/Premedication-or-Antibiotics. Accessed December 31, 2018. Diseases of the tricuspid valve. Texas Heart Institute website. Available at: http://www.texasheartinstitute.org/HIC/Topics/Cond/vtricus.cfm. Updated July 2015. Accessed December 31, 2018. Tricuspid valve disease. EBSCO DynaMed Plus website. Available at: https://www.dynamed.com/topics/dmp~AN~T905712/Tricuspid-valve-disease. Updated September 20, 2018. Accessed December 31, 2018.